First off, welcome to this new series where I hope I can share with you many applications I’ve found for my devices that help to make my life easier in Japan. I do hope they help you too, and if you have a tip on an app or website, do tell me in the comments or reach out to us through social media. Unless otherwise stated, none of the apps in the reviews are sponsored, and when they are, we aim to give an unbiased review. OK, now that the foreword is out the way, let’s get started! The number one question I get asked by those visiting Japan is “how can I get online using my smartphone?” Unlike many countries, Nippon doesn’t make it easy either; there’s no dashing into the convenience store or wireless shop in the airport after clearing customs to pick up a prepaid loose SIM card unlike so many other countries near us. While the reason why still makes no sense to me after so many years, I’ve gotten pretty good at keeping up with ways to get around this inconvenience and help guests to this lovely country keep connected as much as possible. 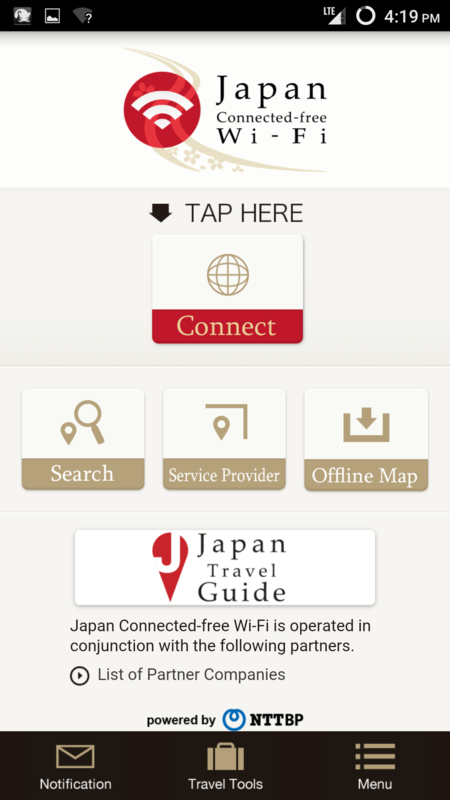 Japan Free Wi-Fi, provided by Japan’s biggest telecom operator NTT, aims help you by amalgamating the numerous free Wi-Fi hotspots found in train and bus stations, public buildings and squares, shopping malls, convenience and grocery stores, and restaurants. The list of partners is rather extensive, and made me realize that I’m pretty much covered by an open hotspot anywhere I go around Tokyo at least. The beauty of this app though is that it does the hard work of finding, mapping, and logging on to the networks for you. This means there are no SSIDs, captive screens, usernames or passwords to deal with. Initial setup is pretty smooth as you can either use your email address and a create a password, or simply log on with Facebook. 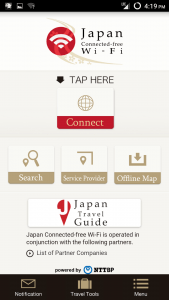 Once signed in, you’ll be greeted by a screen with 5 buttons (Search, Service Provider, Offline Map, Japan Travel Guide) but the one marked “Connect” is the main one we’ll concern ourselves with for now. Hitting that button fires up your device’s Wi-Fi and sets it to searching for a hotspot that the app recognizes. If it finds one, then you’re simply connected, and a box pops up to show you which access point you’ve just started using. That’s it, congratulations, you are now free to Instagram your trip to the maid café or tweet about how you fell asleep on the Chiyoda subway line and woke up 100km away from where you intended to go. True story. * Offline Map is probably the most helpful because how else are you going to find another hotspot if you’re not connected already? * Search links to a Google map of your current position that shows icons for hotspots nearby. Of course you need to already be online for it to work, so it’s probably useful for plotting your course from your hotel or a café. * Service Provider just shows an updated list of the Wi-Fi hotspot providers you can connect to. 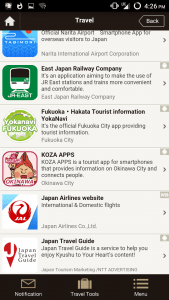 * Japan Travel Guide is an app store link to get you to download NTT’s Travel Guide app. Is it worth it? Well it’s free so try it if you want; we’ll do a review on it very soon. – No need to know Japanese or step through endless menus when trying to use public hotspots at the convenience store or train stations. -Works in many places, and there’s a handy offline map to download so you can find the nearest spot. – Can sometimes hang on searching, necessitating a force close. 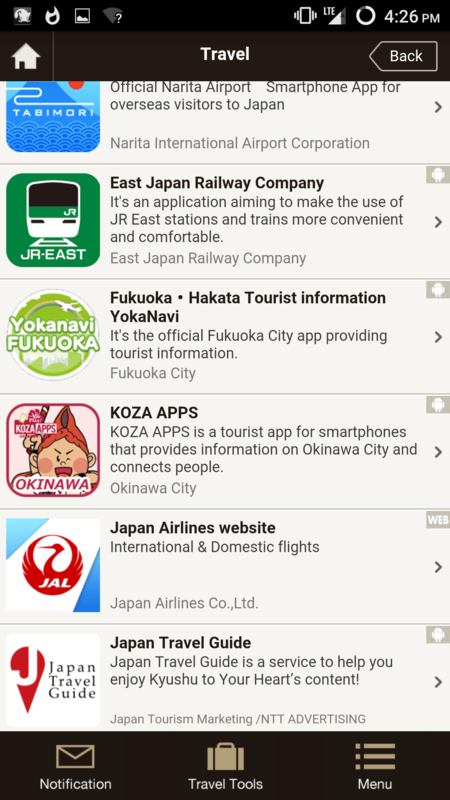 I’m giving this app a favorable score on both the TourNippon and JapanLife lists. If you’re a tourist, you gotta have a way to use the internet no matter where you are, and 90% of the time, there’s a conbini near you where this will work. Even if you are a resident here, you need this– save some bandwidth on your keitai bill and use free hotspots to save yourself from being throttled at the end of the month. Try it now, for your Android or your iOS devices.